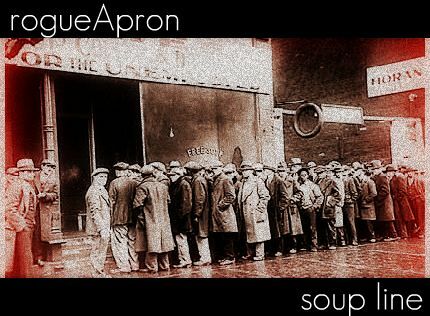 I can’t tell you how excited I am for Soup Line coming up on the 11th. I know I’m not the only one freaked out by the economy – I don’t really know enough to understand what’s happening, but I can see the effects around me. It’s pretty easy to get depressed, especially if you read the NYTimes all day, check your 401k balance, or can’t get gas for your car. I’m not an economist. I can’t understand or fix the problems. But what we can do is come together as a community to share a meal. It’s a simple act, but it shatters preconceptions. We can change what we do. We can change how we act. We can connect with each other on a local level, and come up with solutions to make the lives of our neighbors fundamentally better. I thank all of you who have made a reservation. It really is inspirational to me that so many of you are willing to come with an empty bowl in hand, to meet your neighbors. I just wanted to borrow a moment of your day to say, with sincerity: thank you. Oh, and p.s. If you need to make a change to your reservation, please let me know ASAP – we are making very specific amounts of soup to serve different diets.